Or rather, how old is your plumbing system? 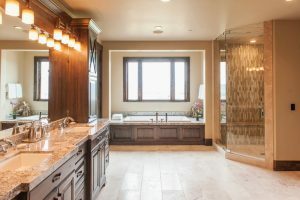 If you’ve reached the point where you’re considering a bathroom remodel, it’s likely because you have an older home that needs some upgrades, or at least updating the style. For a home that was built prior to 1970, the piping material is probably too old and needs replacement anyway. Homes built before this period often used galvanized steel pipes rather than copper, CPVC, or PEX pipes—all of which are better choices. Galvanized steel may be durable, however, it’s prone to corrosion of time, and you should have it replaced at any opportunity you can. Since a remodel in your bathroom will expose the pipes, it’s far easier and less time-consuming to have the replacements done as part of the overall remodeling project. Additionally, a planned pipe replacement allows you some wiggle room in the design process for your bathroom remodel. If you or your remodelers have to work around existing plumbing, it can limit the options for rearranging the bathroom and putting fixtures in alternative locations. If our plumbers work with you to change out the plumbing entirely, then it opens up the process to more extensive re-design concepts. The plumbers on our team will work with you from the earliest planning stages of your remodel all the way to the finishing touches. Whatever your plumbing needs are in order to create the bathroom you’re envisioning for your home, we have the expertise and training to work with you in fulfilling that vision. There’s another advantage to working with professional plumbers, rather than attempting to fix, adjust, or install plumbing parts and fixtures on your own. Professionals have the experience and know-how to realize exactly what your bathroom needs. For instance, do you know your current toilet’s rough-in size? The rough-in size is a description of the opening on which the toilet is installed. If your new toilet is too big, or too small, then it cannot be sealed correctly. As a result, you’ll end up with messy leaks and potentially costly plumbing repair needs. Another factor to consider is your shower floor. A common mistake that inexperienced home remodelers make is not slanting the floor correctly. This means that water is unable to go down the drain, and instead just stands stagnant on your shower floor. Avoid bathroom plumbing installation problems by contacting BZ Dependable Plumbing & Heating Inc. for quality service and guaranteed satisfaction!